NTEP evaluated and approved. Complies with latest requirements of NTEP handbook 44. Low profile provides easy vehicle access maximizing productivity. 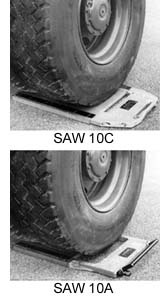 Entire unit - weighpad, electronics and handle - can be run over without damage by a normal truck tire. Hermetically sealed strain gauges provide consistent accuracy. Corrosion resistant weighpad easily handles dual tires. Electronic digital readout easily seen from a standing position insures error free weights. Powered by long life rechargeable batteries. Capability for total axle load to be read on either side of vehicle (optional use).